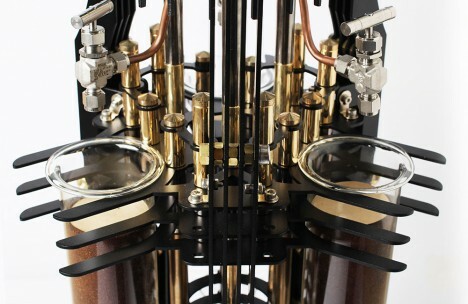 Your countertop coffee maker will suddenly look inadequate compared to a monster of a sculptural espresso machine, an elegant steampunk orb and a piston-powered copper coffee maker fit for a villain’s lair. 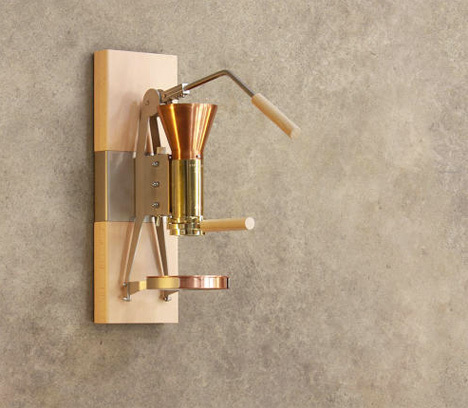 These 13 artistic, high-end and highly unusual coffee and espresso machine designs take the process of brewing your essential daily caffeine intake to the next level and then some. 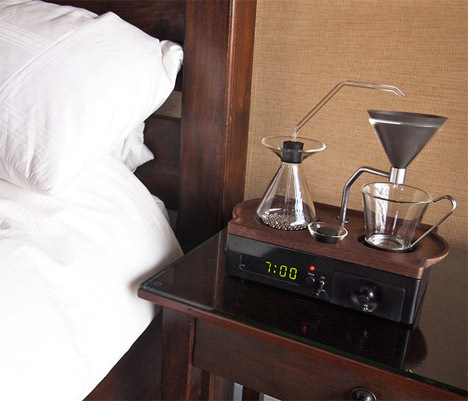 Would you ever guess, seeing it across a room, that this thing is a coffee maker? 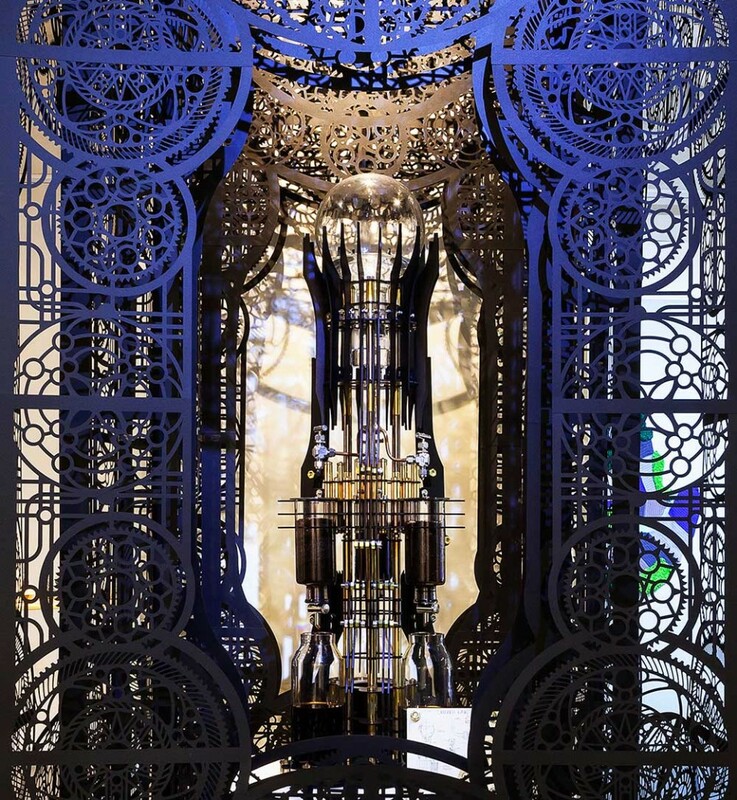 Dutch Lab created this Gothic-themed steampunk ‘monster’ intending for it to look a bit evil. 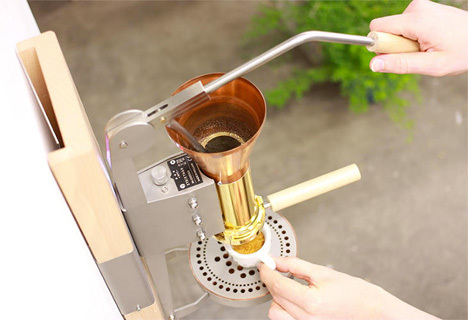 The AKMA is named for the Korean word for ‘devil,’ and like all of Dutch Lab’s coffee machines, it uses a cold-brew technique relying on the force of gravity and a very particular grind of coffee beans – finer than those used for drip coffee, but coarser than those used for espresso. 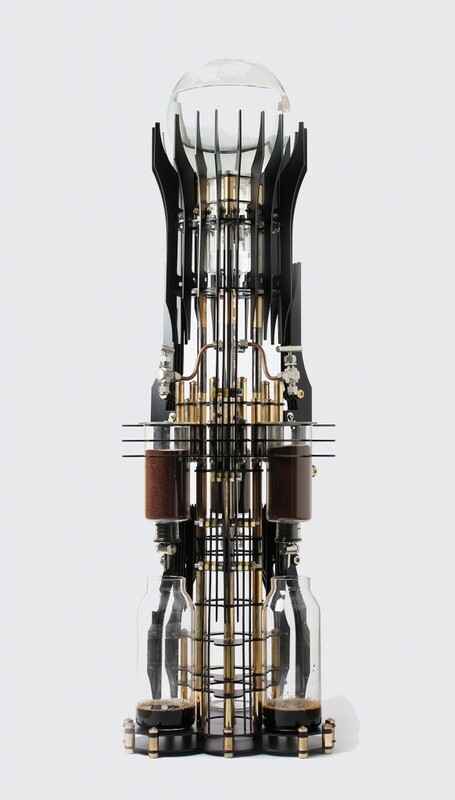 Another steampunk design looks like something straight out of a scientist’s laboratory. 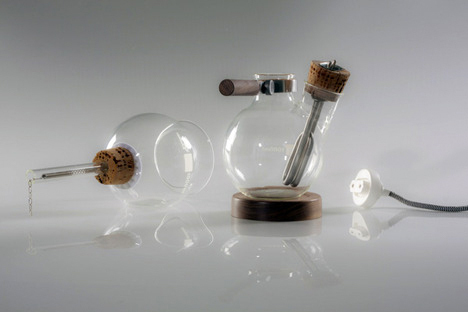 Café Balão by Davide Mateus consists of a pair of hand-blown glass vessels, one of which contains a wand-style heating element to boil the water. 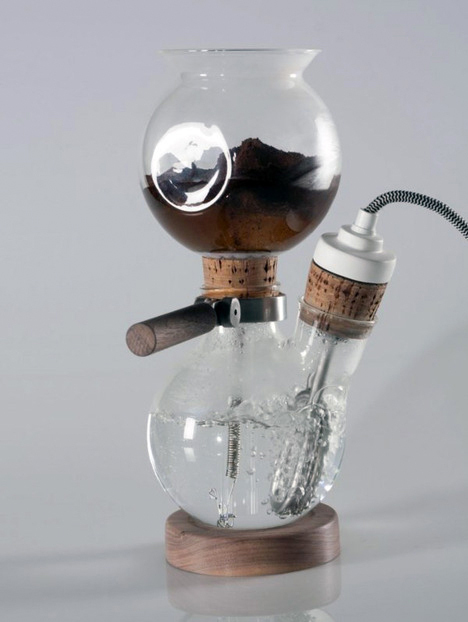 This siphoning coffee maker uses vapor pressure and vacuum to produce coffee, with vapor from boiling water in the lower chamber forcing water into the upper chamber containing the coffee grinds. 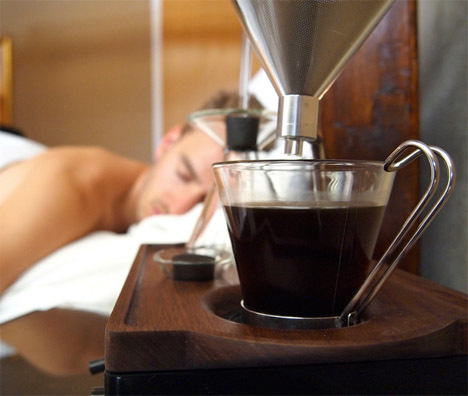 When the heat turns off, gravity pulls the brewed coffee into the lower vessel. You’ll feel like you’re doing something diabolical when you pull the lever on the Streitman ES3 Espresso Machine, except instead of blowing something up or revealing a secret lair, you’ll be starting the piston-powered process of making a cup of espresso. The sleek wood and copper design forces hot water through ground coffee with a piston, and is available with a dual spout for making more than one cup at a time. It doesn’t come cheap, retailing at $1,700. Is this the world’s most minimalist coffee maker? 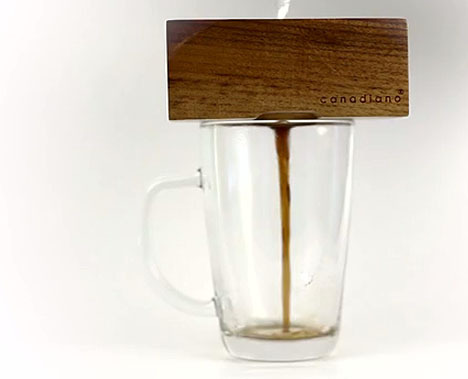 The Canadiano is a single-serving brewing device made of wood, which you simply place on top of a mug. 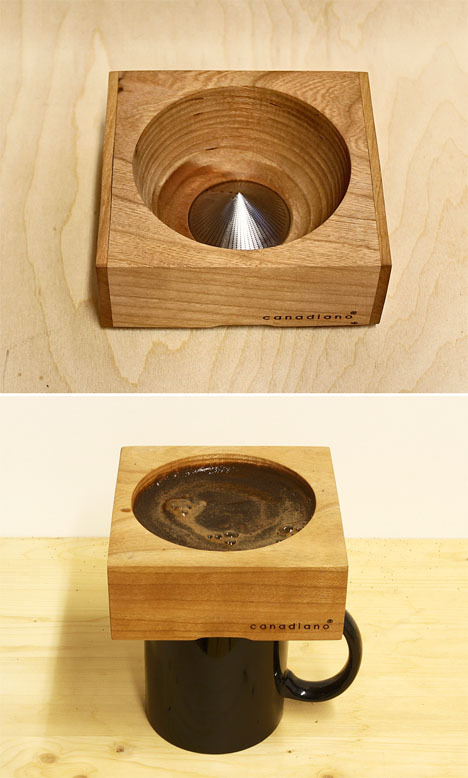 Add coffee grounds, pour in some hot water and wait for your brewed coffee to seep through the metal filter. It’s available in three different wood varieties which ‘remember’ your choice of coffee, building up the oils of your specific beans and roast over time.